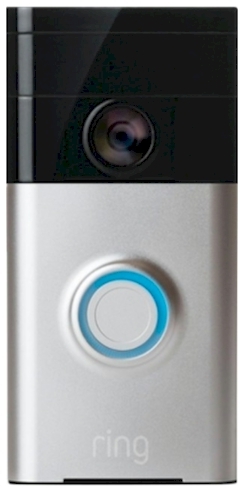 Best Buy has got the Ring Video Doorbell for $99.99 with free shipping, which reflects an $80 price drop. It got 4.3 out of 5 stars over 2,865 customer reviews. Description: Find out who's at your door, even when you're away from home. Just connect the doorbell via Wi-Fi and use the Ring app on your iOS or Android device to interact with visitors, receive alerts and review footage. Versatile smartphone compatibility - Works with select iOS and Android devices. Wi-Fi connectivity - Makes it easy to link with your home wireless network. Download the Ring app to view footage and receive alerts on your mobile device - You can keep an eye on your home and speak with visitors, all from a remote location. Record wide-angle high-definition video - Maintain a clear view of your home's entrance for optimal security. Optional Cloud recording lets you view footage at a later time. Automatically record footage and receive alerts when motion is detected - Motion sensors let you know when someone is at your door. Night vision - Infrared LEDs allow you to record footage, even in dim lighting. Connect to your existing doorbell wiring or use on the doorbell its own - A built-in battery enables standalone use. The doorbell comes with the supplies you need to install on a variety of surfaces, including wood, stucco and cement.